Find out how to tie an obi knot and ways this knot has become a fashion inspiration in addition to its functionality. Obi is the Japanese word for sash, and an obi knot is the traditional style of knot for the thick belt or sash worn with judo, aikido and karate martial arts uniforms. Obi knots are also traditional types of Japanese clothing such as kimonos, Hakama skirts, and Yukata kimonos. 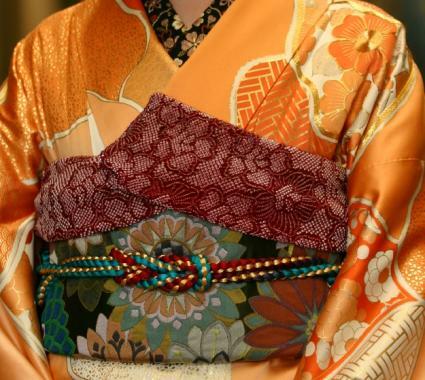 Women's traditional Japanese clothing often uses other types of knots with the sash, such as the taiko or drum knot, which is a shaped knot often worn at the back. In contemporary fashion, sashes or cloth belts are a popular way to embellish or accessorize. The obi knot can be used in a variety of clothing styles, such as trousers or slacks with sashes; wrap shirts or dresses; dresses with cloth belts, scarves, or sashes; skirts; and formal evening dresses or bridesmaids gowns. Knots may be tied to the back, front, or side of clothing. Like the many ways to wear a pashmina, an obi is an inspiring item that can be used in a variety of ways in contemporary fashion.From a functional standpoint, a secure knot will keep a uniform or clothing secure. From a fashion standpoint, a nicely tied knot can add a unique decorative element and special touch to a dress, kimono, or other attire. Begin with wrapping the obi around your waist twice. Once the obi has been wrapped around the waist, allow the two ends of the sash to cross one another. Tie so that one end is up through the belt and one end is below. Loop the top portion of the obi down through the portion of the sash that was wrapped around the waist the second time. Pull the bottom end up, over, and through the top loop. Place the second end down and through. Pull both ends down through the loops and tighten securely. (Ends are traditionally equal length). For obi style belts or sashes worn with dresses or skirts, turn to the back or side for fashion flair. You can also leave the ends looped in or pulled into a bow for an added feminine touch. Since there are different variations in tying an obi knot, many tutorials are available to assist with knots for different types of attire. See the following tutorials for instructions and pictorial visual aids. How to Tie Your Judo Belt: This simple tutorial uses an animated image and shows how the obi overlaps and intertwines to create a secure knot. Karate Kobudo Obi Tutorial: Shows how to tie a safe and secure obi knot with a common method for martial arts uniforms. Rising Sun's How to Tie Obi Tutorial: Provides illustrations and instructions for wrapping and tiring a complete woman's kimono sash, including the obi ita (sash with a flat thin board to help keep its shape), how to secure the Obi Makura (pillow used to provide stylized shape), tying the decorative scarf called an obi age (which is worn above the thicker sash), and cording and securing over the remainder of the obi ita. Japan Culture Club Kimono Faqs also gives a picture tutorial of a full kimono sash similar to the one above. Sometimes even the best instructions are no substitute for watching how the knot is tied. If you're a visual learner, these videos on how to tie a knot will be helpful. You Tube Judo Belt Video: This video demonstrates how to tie a standard obi knot for security during judo. Japanese Yukata Obi Tying: This tutorial illustrates how to secure woman's wide sash with string for a yukata. There's no doubt that the obi knot is both functional and an influence on contemporary fashion. Whether for safety during martial arts, or as a decorative element in a woman's wardrobe, obi knots are a time honored tradition that won't be going anywhere soon.